It has been a busy week. I've actually been motivated to work on stuff. With only a little over a month left til Farm Chicks, I really need to kick it into high gear. Here are just a couple little projects I've been working on. This little bed side table was a recent find at Value Village. 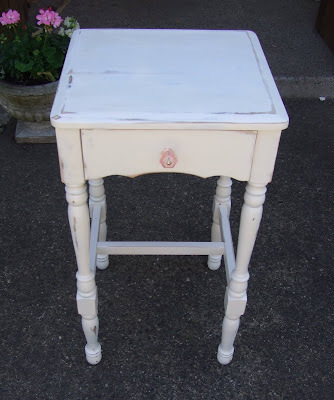 It was brown, it was ugly, but I could see that it had cute details like the legs and the bottom of the drawer. 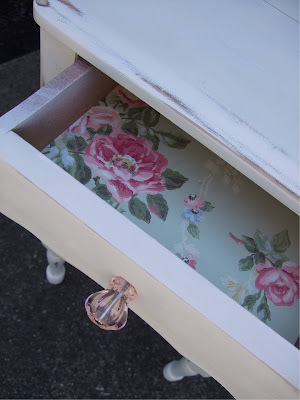 A couple coats of white paint, some distressing, a cute pink glass knob and some pretty floral wallpaper in the drawer and what was once an ugly duckling is now a beautiful shabby swan. 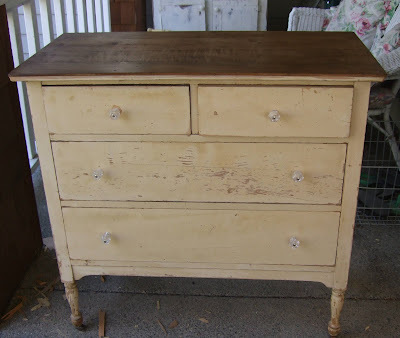 This is the dresser I got on Craigslist last weekend. If you remember, the top was really beat up with veneer missing, cracked, etc. I spent a few hours with a scraper and a heat gun and after a little sanding and staining, here is the end result. I love it! I love that it is now fresh and clean looking while at the same time rustic. Here is a little project I started at least a couple years ago and just sat in my garage. 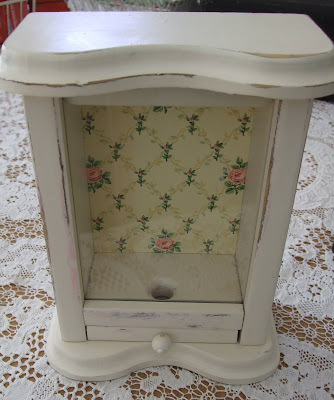 A little wood and glass candy/gum dispenser that I painted, sanded and added the cute rose wallpaper on the back. I have a couple other smaller pieces of furniture complete, but haven't taken a picture yet. It's Friday which means garage sales around these parts, but I really should stay home and get some more painting done. I mean, it's not like I don't have enough stuff already. Trust me, I really do. But as you know, the finding is my favorite part. On Wednesday I went to Monticello with Mitzi who was putting the finishing touches on her space for the sale this weekend. I took a few new things in but when I got to my booth I "lost that lovin feeling" as Mitzi would say. After she finished with her space she came over and totally helped me rearrange everything. Sometimes it is so nice to have that extra set of eyes to see things in a new way. Now, I'm loving my space again and I'm hoping I will sell lots this weekend. Tomorrow Isabel and I are headed north to the Whimsical Wishes show in Camas and then we'll make a stop at Monticello where I'll try to get some pictures of my new and improved booth. I'm hoping for good weather. Have a great weekend. I'll be back on Monday with more projects to show. I'll leave you with a shot of a pretty corner in my back yard. My husband took this picture. You may remember this fountain last winter when it was piled high with a ton of snow. I love spring! Where do you find wallpaper like that?! 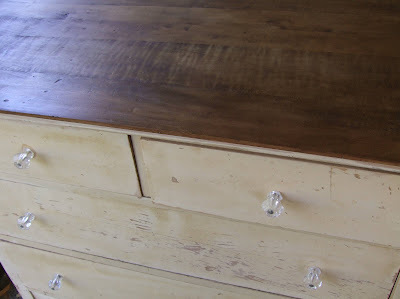 Been scrolling own through your blog and love all the great "stuff" you've collected, especially the refurbished chest. I much prefer pieces like this than anything new! That corner of your garden looks like heaven on earth! If I sat in that adirondack, I would never get up. Happy Junky Weekend! All beautiful, Lisa. Perhaps I will bump into you at some point between today and tomorrow, for I hope to venture out too! Good to chat with you yesterday dear! Now i have the pictures to go with what you were talking about - the dresser top turned out great and the little gumball/candy dispenser is adorable (you should add a few pink candies, so people know what it is). Stopped by Monticello today and your space looks so great...so much easier to get into..Mitzi did a good job. Have a great weekend. Finished your badge too! I am feeling so lazy after viewing the results of your labor. Your furniture transformations are incredible. I love the job you did on all these.. My heart jumped when i saw the wallpaper in the drawer WOW it is beautifull.. I would die to find paper like that around here at our flea markets and shops. Your furniture is looking beautiful. I have heaps of pieces to get stuck into as well but like you, the finding is the fun part! Oh I love that fountain! It seems very relaxing. You did a great job on the finds too. That's what it takes to get me moving, too-a deadline! I keep muttering "I need another week" but I just woulda waited another week to start! I like what you've been working on. oone thing that you find therre that I don't see around here is the vintage wallpaer. It really does add a sweet touch! I'm glad to hear that shop is still open in Centralia-it is one of my favorites-very inspiring, isn't it?